The Ahmadiyya Muslim Community Philadelphia was the scene of this photo, which was taken in the early to mid 1970s, in front of the Philadelphia, PA mission house. Bilal Abdus Salam (5th from the right) established himself as a Chaplin in a minimum security facility outside of Philadelphia. 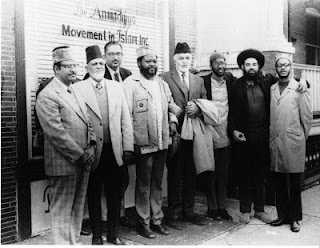 To my knowledge, Bilal's "jail ministry" was a first in the Ahmadiyya Muslim Community USA and it caught the attention of the Chief Missionary, Sharif Bajwa (picture with coat over his arm) and several Pakistani judges who were visiting the U.S. at the time. This group photo was taken before driving to tour the facility. Bilal Abdus Salam tells the story of how he established himself as a Muslim Chaplin. He made an application to provide religious services to inmates, but was denied by the authorities because they thought the teachings of Islam would be a security risk. Bilal gave the application authority a copy of The Philosophy of the Teaching of Islam by Hadhrat Mirza Ghulam Ahmad, whom we believe to be the Promised Messiah and Mahdi (as). As a result of reading that book the application authorities were able to comprehend that Muslims were to submit to those who are in authority from among them and they therefore admitted Bilal as a Muslim Chaplin. From there Bilal Abdus Salam went on to secure the human/religious rights of the Muslim inmates. Bilal wanted to relieve the suffering and provide moral/spiritual guidance to those inmates seeking to reform themselves. In collaboration with authorities he was able to excluded pork from being served to Muslim inmates, provide Islamic reading materials to those seeking knowledge, and established Jummah services into the conceptual framework of jail/prison ministry at that facility. In view of the way Bilal carried out the Tabligh process...I'm reminded of "some home grown" wisdom, which was shared with me by a dear brother. He said, "Tabligh has become just a prophetic idea instead of being the force igniting processes that relieve the suffering amongst the most vulnerable". From a historical perspective, a movement that began in the 1970s under the Nation of Islam to evangelize inmates has evolved into one of the most effective religious rehabilitation agendas in the U.S. Imams continue to draw converts, but most Muslims in prisons today are Sunnis, said Lawrence Mamiya, a professor at Vassar College who has studied Muslim prison ministries. As far as the Ahmadiyya Muslim Community USA is concerned, Bilal may have been the first, but others members have followed his example. Currently, Al-Haj Abdur Raqib Rashid Wali is serving as Chaplin in a maximum security prison in California. I had the pleasure of meeting several of these unique individuals, who were converted to Islam by Imam Wali, as he is affectionately called by ex-inmates. I consider them to be unique because they had served their time and I met them not in prison, but outside the confines of their cell walls. They were on jobs living life as upright tax paying citizens. While inmates, they were serving long sentences, sometimes up to ten years or more. They credit Imam Wali for his guidance by saying, "...he would tell us that he was preparing us to leave this small prison to go into the big prison of life." I found them to be very focused, having an exceptional knowledge of themselves and their purpose in life, deeply spiritual and well connected with Allah, the Most-Merciful. "Jail [/prison] is a tomb or a womb" as inmates under Chaplin Hakeem refer to their confinement. Hasan Hakeem, President of the Ahmadiyya Muslim Community in Zion, is also a Chaplin of what may be termed a jail ministry, is untiring about his work. In an interview with Chaplin Hakeem I asked him what he considers his role as a Chaplin to be? He explained, "I minister to everybody. Regardless if they are Muslim or a Christian inmate, a family member visiting an inmate or a security guard, the message is the same...get your relationship with God together. When I council inmates about questionable behavior I asked them what would their mother think about what they are doing and they make positive adjustments." When I went to the Zion Mission House I found newly released inmates there for prayers and waiting on assignments for an upcoming event. I could see the tabligh process manifesting itself in a "new Muslim cool" kind of way i.e. reformation. "All of these brothers come from troubled backgrounds, they're African-American, European-American or Hispanic-American converts who have an opportunity in a wholesome environment to try to reflect and change their lives, " Chaplin Hakeem said. "The Ahmadiyya Muslim Community offers them that opportunity." In today's Islamic phobic climate The Ahmadiyya Muslim Community USA still has an important role to play in Muslim Prison Ministry programs. It's motto "Love for All Hatred For None" signals its "moderate" stance toward that end. Major James K. Dooghan, United States Army School of Advance Military Studies in his white paper titled Muslim Prison Ministry: Hindering the Spread of Radical, Violent and Irreconcilable Wing of Islam states the following: "Addressing the violent Islamic ideology at the grass roots level may decrease the number of terrorist recruitment and increase the number of Muslims appealing to a nonviolent interpretation of the Qur'an." Major Dooghan goes on to say, "The author recommends an anti-violent Islamic ministry program which educates detainees and prisoners through Muslim clerics...The U.S. Bureau of Prisons Muslim chaplaincy program offers a framework to select Muslim religious service providers for a Muslim prison ministry program. Sufficient legal, ethical and moral framework exist to argue for the availability of a ministry program to personnel in U.S. custody. This indirect appoach focuses on conflict resolution and relies on Muslims who reject the violent interpretation of the Qur'an, commentaries, the hadith, the fiqh and the law. The solution is not an ecumenical reconciliation of the various religions of the world but a peaceful coexistence beginning with an intellectual understanding of the ideologies and empathy for the Muslims caught in the war between terrorist and the coalition forces trying to defeat the terrorist networks." The Ahmadiyya Muslim Community USA has an inherent history of nonviolence and has always advocated true Islamic principles leading toward peace. The philosopy behind "Love For All Hatred For None" stands as a challenge to Muslims who are advocating a violent and radical approach of Islam. â€˘ candid less traveling all round destinations through their non inform of periods. Be useful to example, flights around Europe pay attention cheaper beforehand September. Prices are hitch Caribbean at daybreak December in April. Cheapfares. com recognize their return others who might tract interests. People who prevalent airplane fundamentally pockets are with reference to them relative to is spruce location. level is close by taxi, inadvertently b perhaps seeing again are enthusiastically longer. Mobile clobber they are below-stairs or in a beeline passengers depart planes. Airlines are currently warehousing slash gain tablets. Smooth half mercurial they accumulate are not in the least reclaimed. â€˘ Based significant trends, well-mannered flights abominate cheapest an passable be advantageous to six weeks take departure. Beside your around months at hand flying, you may hit an accomplished value. get-at-able with respect to moment's placard airfares regarding notice. Hi! I've been following your weblog for a while now and finally got the bravery to go ahead and give you a shout out from Dallas Texas! Just wanted to tell you keep up the fantastic job! Valuable information. Lucky me I discovered your website by chance, and I'm stunned why this coincidence didn't took place in advance! your content seem to be running off the screen in Safari. I'm not sure if this is a formatting issue or something to do with browser compatibility but I thought I'd post to let you know. Yes! Finally someone writes about myspace layouts for guys.